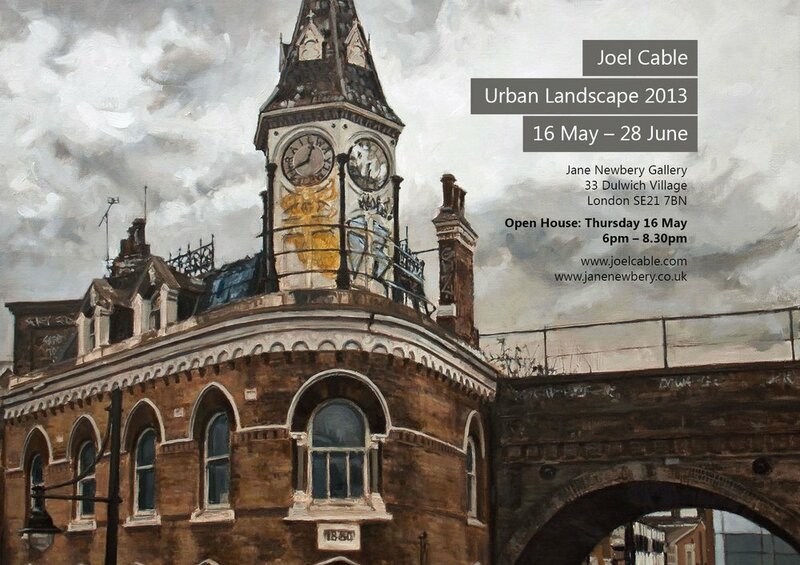 Jane Newbery Gallery (www.janenewbery.co.uk) in South London’s Dulwich Village will host a 6 week solo exhibition of my work, from 16 May 2013. I will be attending the open house on Thursday 16 May from 6 to 8:30 pm, so if you are in London, please stop in to see the work, say hello and have a glass of wine with me. Details of how to get to the gallery are listed on the postcard below, or on the gallery website. I aim to have at least 13 pieces ready to display by opening night, but many of the completed pieces are a now displayed in the Portfolio – Cityscape section of the site. I’ve drawn inspiration for the work from a number of great cities around the world, including London, Liverpool, New York and Paris, but in general, I’ve kept close to the streets and neighbourhoods near to where I live and work. I’ve focused on scenes that anyone might see while walking around a city, looking, and taking notice of something that seems special or beautiful, yet understated and unremarkable in terms of its normality. I am increasingly becoming drawn to the more ignored areas, or places in a state of deterioration, and starting to develop a way of representing wear, age and neglect in paint that gives a feel of dirty realism, but avoids straight photographic representation. This is the idea I had in mind with Brixton Clocktower, W1 Alley and others still in progress. Thank you to my good friend, the talented Jonathan Price, for all of his help in putting together promotional materials for the exhibition.